How well does your school meet student expectations? Take this quiz to find out. Your school is respects and knows how to honor student expectations. Your school is in touch with student expectations and has structures in place to meet them, but there are areas in need of improvement. Your school has begun the path of meeting student expectations, but must continue to put effort into the process. Your school has little awareness or priority on student expectations. The Leaving to Learn movement, started by Elliot Washor and Charles Mojkowski is built on the idea that a great way to learn to find success in the world is to be in the world. The first step is taking down the barriers between school and the outside world and letting students leave, to learn. Washor and Mojokowski recently published a book on the topic. In it they bring the philosophy to life via real examples from schools following the Big Picture Learning model. If you're unfamiliar, students in these schools usually spend a couple days each week in the world pursuing their passions. What sets these students apart from those in traditional schools is that upon graduation, not only are these students deeply connected to that which they are passionate about and others who share and can help them pursue these passions, but they also graduate with authentic, real-world experience and expertise. At the heart of this philosophy is the idea that learning should be student centered. To do that we need to be clear on the expectations students have our their schools. The following diagram outlines the ten expectations which young people want from their schools. Read more about these expectations and watch videos of this in action here. I've created the following ten question quiz based on these student expectations of school. This is a terrific conversation starter for transforming schools. The next step is to work with students, educators, and the school community members to devise a strategy to ensure these expectations are met. Doing so is of utmost importance in giving adolescents a pathway to success in school by meeting expectations that have been proven to inspire and motivate kids to keep on learning. The authors explain that doing will address the challenges of our nation’s dropout rate and allow us to keep kids in school and prepare them for life after graduation by delivering authentic learning experiences that matter to them. 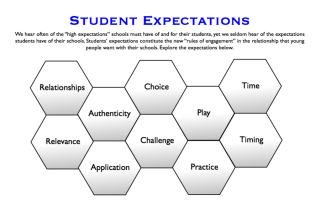 See how well your school meets student expectations using the following scale. Take this ten question quiz then find out your results. My teachers and others who might serve as my teachers know about me and my interests and talents. I find what the school is teaching relevant to my interests. The learning and work I do is regarded as significant outside of school by communities of practice and by experts, families, and employers. I have opportunities to apply what I am learning in real world contexts. I have real choices as to what, when, and how I will learn and demonstrate my competence. I feel appropriately challenged in my learning and my work? I have opportunities to explore--and to make mistakes and learn from them without being branded as a failure. I have opportunities to engage in deep and sustained practice of those skills I need to learn. I have sufficient time to learn at my own pace. I can pursue my learning out of the standard sequence. How well did your school meet student expectations? Share your results here. This poll has received that maximum number of votes. Web voting is currently disabled for this poll. If you created this poll, enable web voting, then refresh this page. This poll is stopped and not accepting responses. If you created this poll, start the poll, then refresh this page.